These medium-sized swallows are iridescent steely greenish-blue above and white below. Males are iridescent greenish, while females tend to be a mixture of brown and greenish-blue iridescence. They have a short black beak and dark reddish brown or brownish gray feet. 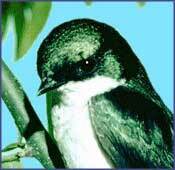 The tree swallow is a short-distance migrator. They gather in large flocks along the coast in the fall. They are the first swallows to reappear in the spring. Tree swallows are highly social and may form flocks of several thousand birds at nighttime roosts outside of the breeding season. However, they are strongly territorial during the breeding season. Nests are typically built in cavities in dead or live trees (excavated earlier by woodpeckers or other species) or in hollow stumps over water. However, they can also be found under the eaves of buildings, in steel drums, fire hydrants, holes in the ground or nest boxes. See our complete list below of recommended bird deterrent products to repel tree swallows. A "synergy" or combination of bird repellent products typically offer the most successful solution for repelling tree swallows. For bird control solutions, we often recommend using companion products by combining electronic sonic repeller devices or bird hazers with visual scare deterrents, physical bird barriers or scent and taste aversion products. This kind of multi-sensory attack is extremely effective in deterring pest tree swallows for good!